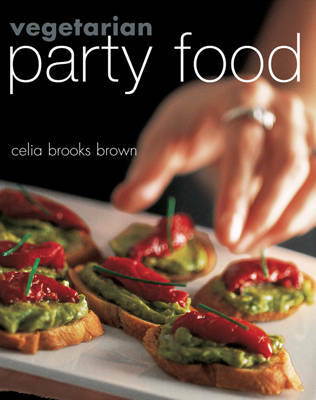 Redesigning party food with a more vegetarian nature, this is an essential book for anyone who entertains. It contains over 80 recipes that will appeal to vegetarians, vegans and meat eaters. The original Hardback edition being (ISBN 1862055343) "Entertaining Vegetarians". Ten per cent of the British population, almost 6 million people, are vegetarian, with 5,000 new vegetarians every week. In the US, there are over 13 million vegetarians nationwide, and the percentage is rising each year. In both countries, therefore, the likelihood that a vegetarian is coming to a dinner party for 10, or a cocktail bash for 100, is inevitable. While a good cut of meat will benefit from simple cooking and little adulteration, vegetarian food poses more of a challenge. "Entertaining Vegetarians" is packed with 80 stylish and mouthwatering recipes, many fast and all uncomplicated. Each one can be inserted into an otherwise omnivorous menu, and all are appealing to meat eaters and vegetarians alike. There are plenty of people who are mainly vegetarian but occasionally eat seafood, so a fish chapter is included. Feature spreads give advice and menus for a range of special occasions, from cocktail parties to picnics. Beautifully illustrated and engagingly written, with plenty of smart tips and timing suggestions, this is an essential book for anyone who likes to entertain.